Most boat owners would agree that launching boats into the water down the beach or down the boat ramp is not an easy task. Just imagine how grueling it is to haul the entire boat along with your extra gear (motor, cooler batteries, etc.) on your own. There is a great solution though: installing launch wheels on your SIB! Simply put, these launch wheels can make everything simpler and much easier. A boat launching system is practically a set of wheels to help you launch your boat and transport it from one place to another. For example, from your car/trailer in the parking lot down to the water. Launch wheels are installed on the transom of your inflatable dinghy and are a lot different from boat trailers. 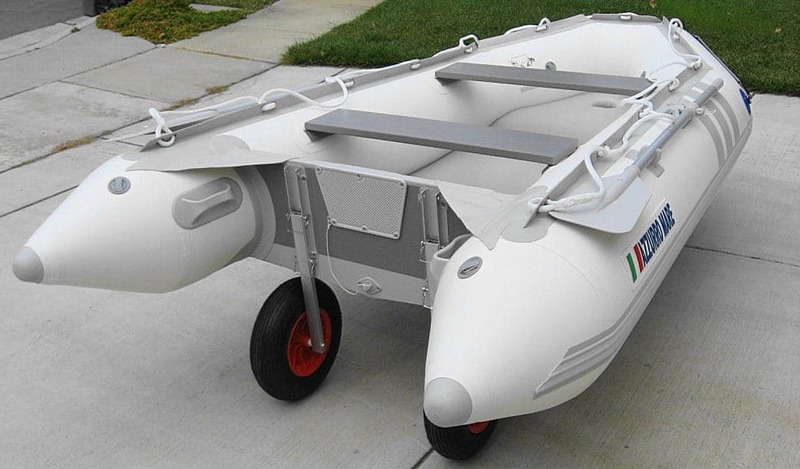 With wheels attached to the outer side of your boat’s transom, you can easily transport your boat (and whatever you put into it) to and from land without much effort. 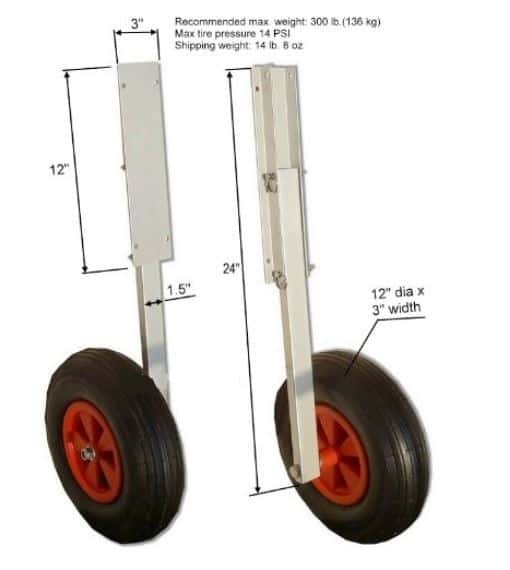 They are specifically designed to reduce the amount of lifting in transporting your boat from point A to point B. By installing launch wheels, you can also prevent your boat from getting damaged as you drag it back and forth over various surfaces. Now you can see why launch wheels are basically the next best thing to sliced bread. At least from a SIB owner’s perspective. 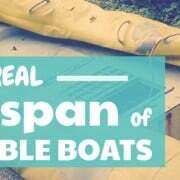 Can they hold your boat’s weight? 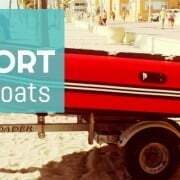 For larger and heavier boats, you may consider getting a boat trailer instead. Most wheels commonly range between 10 to 15 inches in diameter and 2 to 4 inches wide. The bigger the wheels are, the easier it is to push over more difficult terrain, like sand. But other than this, smaller wheels can suffice, as well. They need to be made from highly durable materials to enable them to withstand the long exposure to saltwater which causes corrosion. This is why most launching wheel frames are made from either aluminum or stainless steel. Tires, on the other hand, are usually made from rubber and can either be solid or inflatable. Inflatable tires allow higher psi. 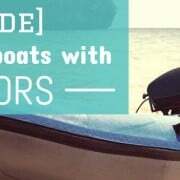 Many inflatable boat manufacturers nowadays leave markings or cut-outs intended for transom wheels’ bolts and brackets. However, if these markings are nowhere to be found, you will have to make some measurements and create holes into which your transom wheels will be placed. Position the brackets on to your boat’s transom. As you make measurements, make sure that the wheels will be spaced widely enough as not to interfere with the motor. Also, see to it that they’ll be installed high enough so to avoid the motor from touching the ground. After marking the mounting holes, you will then have to drill the bolts through the transom. Secure the brackets onto the transom using glue and bolts. Now that you’ve successfully installed the wheels, slide the legs of the wheels. Remember to secure them with lock pins, if provided. Make sure that they can be folded properly as you don’t want your wheels to go off when you’re in the waters. Here is a helpful video on how to install launch wheels. 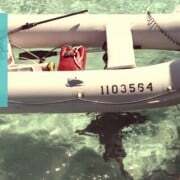 Since inflatable boats can be very heavy, adding a set of boat wheels is certainly a worthwhile investment. By choosing to install wheels on your vessel, you can do everything on your own without having to exert too much effort. To help you out, I have gathered some of the best launching wheels available on the market. This is my launch wheel of choice. It is made and designed by Seamax Marine has the following main features. With Brocraft Boat Launching Wheels, you’ll wonder how you managed to move your boat all this time. 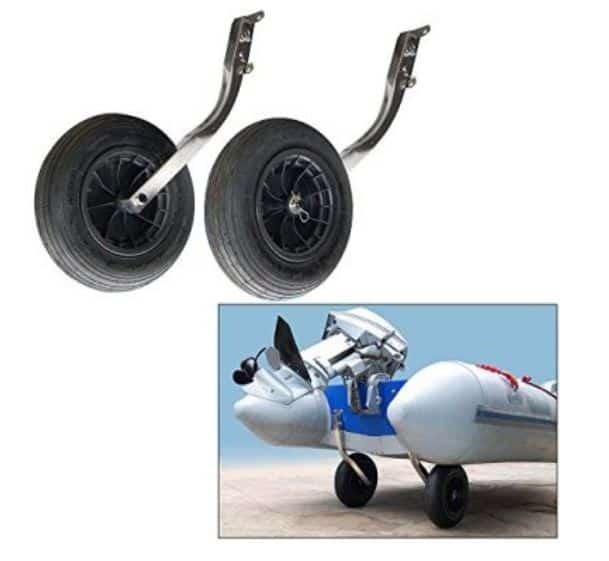 In the “made from aluminum” category, Saturn Inflatable Boat Launching Wheels are the most affordable. These launching wheels can do a great job on any kind of surface. 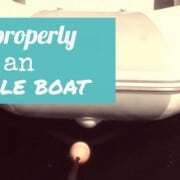 This great product from BRIS allows better movability for a wide range of inflatable boats. Launch wheels are probably the most useful accessories for your inflatable boat. Provided that you’ve chosen the right type of launching wheels and that you have installed them properly on your vessel, you will greatly reduce the time and effort needed to launch your boat. Have you ever tried any pair from the inflatable launch wheels from my top picks? I would be glad to hear from you! Please don’t forget to share your experience in the comment section below.